This morning I got up early, packed my bag and headed to the San Francisco International airport (SFO) to attend the opening of Virgin America's new Terminal 2 (T2). I was expecting Sir Richard Branson to be there, and I had been told to keep an eye out for some appearance from some element of Virgin's Galactic's program, but I had no idea what I was in for. 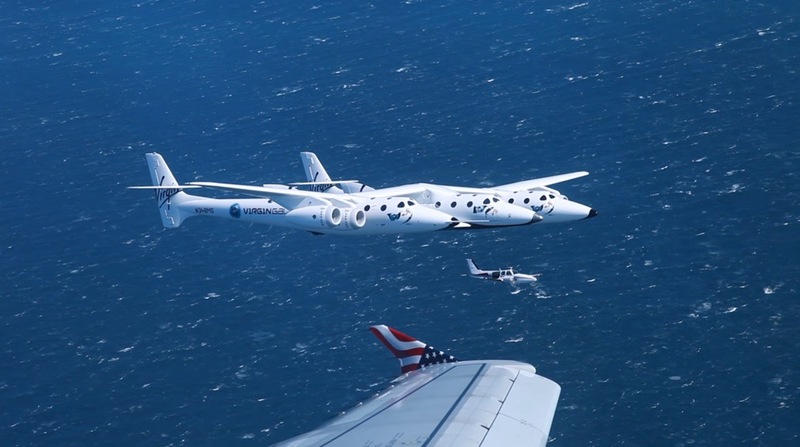 Shortly before boarding the plane, one of Virgin's PR people announced that we would be making a 20 minute flight over San Francisco, rendezvousing with White Knight 2 and Spaceship 2 inflight, then landing in parallel with the spacecraft. After that, I was just in shock. I did what I could to keep myself collected, which was not an easy task. This was just totally unexpected and amazing. At times, the spaceship was only a couple hundred feet away from us. Virgin America has some photos of the flight and the new terminal up on their website.